Most people give very little thought to the storage and shelf-life of over the counter medication, beyond keeping things out of the reach of children. If you stock one or emergency medical kits, you may end up storing medications for longer periods of time. How long is too long to store over the counter medication, and what's the best way to store it? 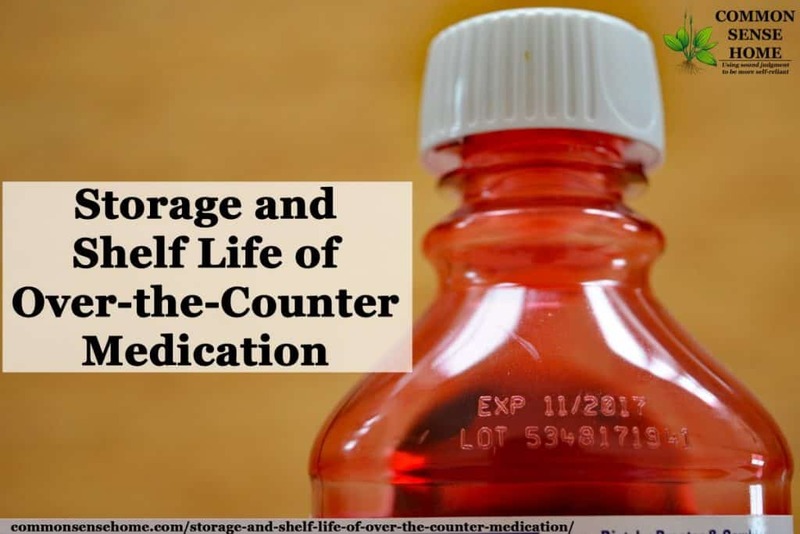 Storage and Shelf Life of Over-the-Counter Medication – How Long is Too Long? Medicines, like food products, have an expiration date on their packaging. The expiration date on medication is the date beyond which the manufacturers can no longer guarantee full effectiveness or safe usage. Generally, over-the-counter medicines should have a shelf life of around four or five years. This means they should last around that long after the date they are purchased. Many people throw food out once after its ‘use by' date, as it is no longer guaranteed safe to consume. The same thing ultimately applies to medicine. Once beyond the expiration date, manufacturers cannot be held legally responsible for any damage the medicine does to you. They can no longer guarantee the medicine will actually do what it is supposed to do. So should you throw medicine out as soon as it reaches its expiration date? The answer is somewhat complicated but – not necessarily. 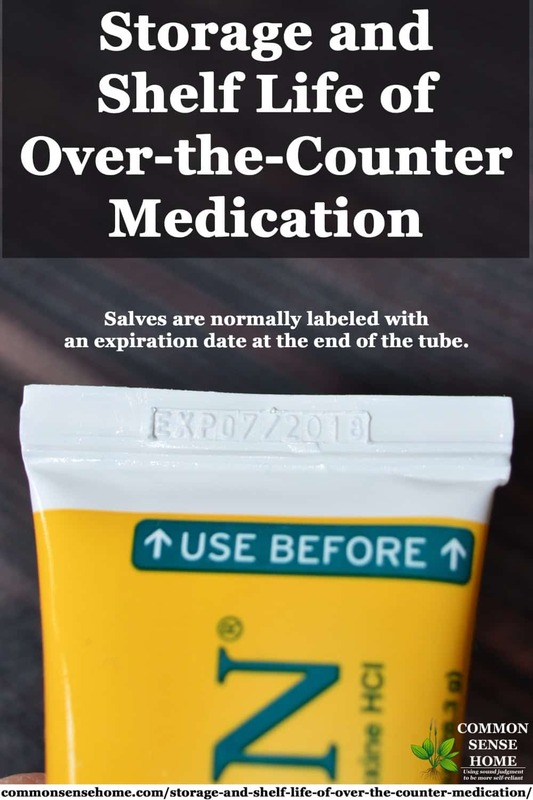 Research carried out by the U.S. Army Medical Materiel Agency suggests that most over-the-counter medication remains stable for several years after reaching its expiration date, assuming correct storage procedures have been followed. Correct medication storage typically requires the medicine to be kept somewhere dry, away from extreme temperatures and below 77° F (25° C). A cabinet, cupboard or medicine box is ideal for this purpose. Store medicine in its original packaging and keep it sealed prior to use. Tablets that are packaged in blister packs are still classified as sealed, even if the outer packaging has been opened. If you open medicine in a bottle, use it before it reaches the expiration date. Open bottle means exposed to air, and exposed to air equals possibility of microbial contamination. Generally, even years after the expiration date, most medicines will be safe to consume, but may be less potent. For instance, if you have a headache and you find acetaminophen tablets that are a year past their expiration date, it's safe to take them. They will most likely help, but they may be less effective than normal. For the most part, medicine will remain safe to consume past its expiration date, however, there are some exceptions. Don't ever use insulin, eye drops and antibiotics beyond their expiration date. These medications typically have a discard date which kicks in once they are opened. Do not use any medicine with a “discard date” beyond this date, under any circumstances. Avoid using liquid medications after they expire. (Tablets and capsules are more stable than liquid medications.) Don't use medicines that have been exposed to light, heat, or moisture beyond their use by date. Although taking medicines such as acetaminophen or diarrhea capsules beyond their expiration date is acceptable as a last resort, it is still not recommended. Use these items only in an emergency situation, where no other possible alternatives exist. You should safely dispose of old medication (see FDA safe medicine disposal guidelines) and replace it as soon as possible. Potency and effectiveness of the medicine may decline after it reaches its expiration date. That said, it is still vital that you stick to the recommended dosage for any medicine. Don't try to compensate for this loss of effectiveness by exceeding the recommended dosage. If in doubt as to whether your medicine is safe to consume, avoid doing so and check with a pharmacist. If you want to stock up on band-aids, rubber gloves or other items that tend to become brittle or lose their adhesive with age, consider vacuum sealing for longer storage. Also, honey lasts for an extremely long time in storage, and is an effective treatment for many conditions. See “Honey as Medicine – Prevent Infection, Kill Bacteria, Promote Healing” for more information. The Herbs and Wildcrafting page and Weekly Weeder series can help you learn to use herbal alternatives. Stay safe and use good judgment. I used to know a nurse who worked in a country hospital (Australia) many years ago and she told me that the hospital often passed some of their out of date or nearly out of date medicine that could be used on animals to the local vet instead of throwing it out. I completely disagree that antibiotics cannot be used after their expiration dates. If antibiotics are stored in a cool, dry, dark place they will last as long as any other pill form of medication — many, many years past their expiration. The “tetracycline myth”, so frequently sited, has been disproven — it was based on a single incident, with questionable conclusions, and has not been replicated. Other than that (sorry for the rant) good information. Medications in liquids and creams form should not be stored long-term. Again, this information is only for a collapse/long-term disaster situation. Under normal conditions follow your doctors advice, and seek available medical treatment. Joe Alton M.D., of [url=http://www.doomandbloom.net/the-truth-about-expiration-dates/]Doom & Bloom[/url] has done extensive research in this topic and has some great information on this and collapse medicine in general. Thanks for the input. I’ve been working on growing more herbal antibiotics (https://commonsensehome.com/herbal-antibiotics/) and learning how to use them, since it’s tough to obtain antibiotics (for most people) to have in storage in the first place. Also, I figure the odds are better of being able to avoid antibiotic resistance. Still, in an emergency, you use what you have available. Most medications can be used well after their expiration date, but some do become dangerous or less effective. It’s best to rotate stock if possible. What, no shout out for catching the temp error? Get info. Keep up the good work. I thought a personal email directly thanking you for your help seemed sufficient, rather than commenting publicly on something no longer visible in the post. Dang, never got it. But in relation to your post, if it’s truly TEOTWAWKI then I am using expired meds. Especially since it might be a while before the stores get restocked. Working in the medical profession for the last 26 years, I know that meds that are close to or have past expiration tend to be shipped to third world countries for use. My husband worked in a hospital run by nuns for 16 years, and they used to use to use the expired meds for their missionary work, too. In ideal conditions, one follows the rules, in less than ideal conditions, you do what you need to do. Still working on my herbal skills to have more treatment options, but much to learn yet. Interesting post. Thanks for presenting this info. It’s written by an MD. It’s more of a history, but interestingly enough, he included a section where he lab tested the efficacy of ancient medicinals. One surprising medicinal was copper, in various forms. It was used as a bacteriostatic topical. (like the old sulfa powders?) The most commonly used forms were Verdigris, which is the corrosion on copper, malachite & chrysacolla (sp?) Also, wine is bacteriostatic. He even determined at what point (age of the wine) that it was most effective. A fascinating read. You might pick up some useful info from this book. I have seen it available at Amazon.com as a used book. I’m pretty sure it is out of print. Interesting. I’ve read some information that linked mental health issues with low copper levels. You should also at least mention that some medications have very strict storage/usage requirements like nitroglycerin tablets. These MUST be kept in their sealed glass jars until needed for use and discarded once opened for the specified number of days. Some medications are just TOO important to mess around with. This is true, and thanks for mentioning it. Critical medication that doesn’t work when needed can be deadly. I’ve heard that you shouldn’t take expired thyroid medications, but I have no thyroid and even if I stock up on OTC thyroid medication it seems it would expire before I could use it all. I don’t know how long I could live without it in an emergency. Any ideas? I’m also on thyroid meds, although I still have a thyroid. I know vacuum sealing dramatically extends the shelf life of food – I wonder if it would help with thyroid meds, too? Have you talked to your doctor or pharmacist for suggestions? They should have a better idea about specific medications. 4-5 years? Hah. I’ve got stuff here that’s so old it would scare you then. Creams expire when they separate into different layers, turn a light brown, or smell off. Syrups, supplements*, extracts, etc. never really expire. They may decrease in potency, but oils going rancid** is about the only thing that you need to worry about. And you’d be able to smell that immediately. Otherwise, vitamins don’t degrade much, and you can double or triple an herb’s dose depending on it’s age. Keep everything in a nice dark place(no countertops or clear cabinets! ), and you’ll be good. *copper supplements do turn from green to black after 10-15 years, but there I’ve noticed no ill effects from them. **if taken orally, there will be a significant decline in taste-strength a while before rancidity occurs. Depending on quality, this can happen between 1-4 years after labeled expiration date. How long can an OTC be used in a skilled Nursing home after opening? Regulations on nursing facilities vary by state. As such, I am not legally qualified to answer that question. I note it’s a year since anyone wrote a comment, but I’m hoping this is still “live”. I have read all above with interest but can’t find an answer to my query, – nor can I when I google it. This may seem a simple question with a simple answer (I hope so!). If you buy/ are prescribed medicine in tablet form, once you have opened the bottle, how long do the tablets remain effective (retain full efficacy)? Assuming of course that you replace, screw the lid back on firmly. The answers above seem to refer to a bottle has never previously been opened as opposed to the constant opening and use of tablets from the same bottle. Also, does it depend on the type of medication? All I have read suggests that so long as the tablets are not moldy/ smell, discolored, or other obvious defects and not past their use by date, then they are fine. This seems a little vague or even risky if the tablets are for a specific, potentially serious illness that requires occasional medication when initial symptoms appear. I am not a pharmacist, but I’m sure that it varies substantially between medications. Even if you close the lid properly, you’ve exposed the contents to oxidation. If they are non-reactive, not a problem, if they do degrade in the presence of oxygen, you’re skunked. This is something you really need to discuss with a trained pharmacist on a case by case basis. 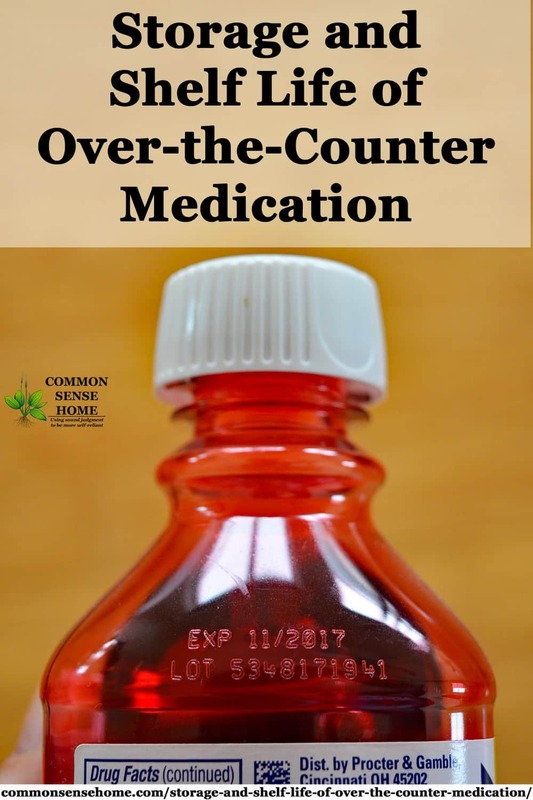 Many medications do retain their effectiveness well past the “sell by” and “use by” dates, but I’m sure with the wide range of medications available, some don’t. Herbal medications tend to break down faster than synthetics. It’s recommended that you rotate them every one to two years. You know how the smell of spices fades over time. Many of those same volatile compounds responsible for aroma also play a part in their medicinal properties. Synthetics tend to be more shelf stable – but not always. And yes – comments will remain live on posts as long as the post itself is still here and I’m around to answer them. Thanks for the reply – more or less as expected. I have some amoxicillin (antibiotic) caps left over because my dentist proscribed 21 but the pharmacy filled it for 30. I’m looking for the best way to store them ‘just in case’. I have a Food Saver vacuum sealer, would that be a good idea? Thanks so much! Glass will keep out moisture and air longer and better. I’d opt for the cool, dry, dark location, as per other meds, but if possible, place inside a glass jar with oxygen absorber and moisture absorber packet(s). thanks Laurie. So you don’t think vacuum sealing them would be good? My first choice would be what I suggested. I don’t think vacuum sealing would hurt them, unless they are the type with powder inside capsules. Then there’s a chance of them getting some of the powder pulled out by the vacuum sealer. If you do vacuum seal them inside a small bag, it would still be good to place that bag inside a glass jar. The vacuum sealer bags do absorb moisture and air over time – slowly, but they do.